GALION — In its 14th year, Ohio’s longest yard sale started Thursday. The Ohio Lincoln Highway BUY-WAY yard sale lasts through Saturday. The trail of sales — big and small — runs from East Liverpool, Ohio to the Indiana-Ohio state line. 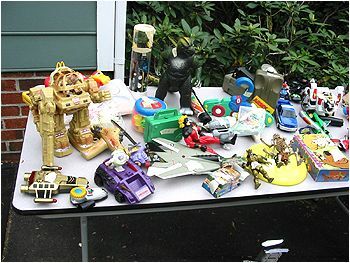 The annual yard-sale extravaganza has grown to more than 1,300 individual sales, after beginning with around 250. With some sales encompassing several, if not dozens of sellers, there is a little something for anyone who is looking for a sale. The yard sales basically the follow the route of the old U.S. 30, but many sites are a little off the old highway: at churches, fairground parking lots and yes, some yards. The old Lincoln Highway in Ohio is 241 miles across, but there more than 400 miles of Lincoln Highway alignments available to shoppers and most of the venues are open from dawn to dusk. As you travel from sale to sale, be on the lookout for remnants of the old highway from red, white, and blue markers, to old style drive-ins and filling stations, to ghost signs for “Lincoln” businesses that advertised their prime location on the highway. For more information on the sale, including maps, places to shop and rest and eat, visit the Ohio Lincoln Highway Historic Byway website at www.historicbyway.com.